OTTAWA -- It's difficult to imagine the scale of the trauma, the wartime anxiety, the shock, the anger, that would have engulfed the nation 100 years ago when the seat of the federal government went down in flames. Seven people died that bitterly cold night on Feb. 3, 1916, when the old Centre Block burned down -- the building that saw figures like Macdonald, Bowell, Tupper and Laurier pass through its halls and sit in the Dominion's first House of Commons. "The grand old tower put up a magnificent fight for survival. Standing while the support seemed to have burned away, it sent a solid pillow of twisting, billowing gold up into the winter night," Ottawa Citizen reporter Charles Bishop wrote. "Finally, it came down, crashing into the concourse in front and with it, carrying the huge, old clock which had stayed illuminated and kept on striking to the last." On Wednesday, the House of Commons will mark the tragedy by displaying the wooden mace that was first used as a replacement after the fire. The House will also hear the names of the victims read out, including Nova Scotia MP Bowman Brown Law. "At one time Sir Wilfrid's voice faltered and entirely broke," reads an Ottawa Journal account of Laurier's speech the day after the 1916 blaze, as the Commons sat at the Victoria Memorial Museum. "The veteran white-haired statesman whose eloquence re-echoed through the halls of the Commons in ruins was overcome with depth of feeling." Laurier would die before the new buildings opened. 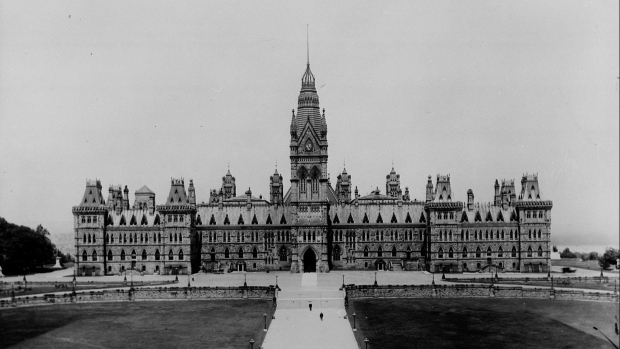 The Parliament Hill fire is one of the enduring mysteries of Canadian history. It happened in the middle of the First World War, and there were many at the time who believed it had been deliberately set by German saboteurs. Just weeks before the fire, an unsavoury American businessman told a newspaper editor that Germans were planning an attack on Ottawa's capital buildings -- the U.S. was not yet at war. American justice officials had received the tip, but the message apparently never made it to Canadian authorities. Still, an official inquiry came up with no firm conclusion on whether it was arson, a careless smoker, or maybe faulty wiring. "You can look at all the facts, and fit them into these theories as best you can, and come to your own conclusion," said Don Nixon, a retired Parliament Hill engineer who explores the arguments in his book "The Other Side of the Hill." "I think it probably was deliberate, I say probably because we don't know. The things we know about the fire, it seems to me point in that direction." The Commons had been sitting that night, when fire broke out in the nearby, wood-lined reading room chocked with newspapers. The flames rose up quickly, spreading with the help of the old ventilation system. The Speaker of the House, Albert Sevigny, rushed to get his children and wife out of the building as the flames spread into his quarters. A guest jumped into a fire department net from a floor above, while two other women visitors perished from smoke inhalation. "I realized that our poor friends were dead and I practically collapsed myself -- I was taken out by two of my men there," Sevigny told a special inquiry later that month. Martin Burrell, the minister of Agriculture, suffered burns to his hands and face in the fire. Prime Minister Robert Borden ran coatless and hatless into the night. Foolhardy reporters like Grattan O'Leary climbed through a window into their main floor workroom to grab precious typewriters. "By this time a great crowd had gathered," O'Leary wrote in his memoirs. "It was a bitterly cold night, and people caught in the building were coming down ladders or leaping into the snow beneath the windows." Inside the current building, which opened for sittings only four years later in 1920, there are a few reminders of the old. The recently scrubbed-up West Block, including the orangey-pink Potsdam stone, is a reminder of what the old Centre Block would have looked like in its prime. The large painting of young Queen Victoria in the Senate foyer was cut right out of the frame the night of the fire by quick-thinking staff. More importantly, there is the Library of Parliament -- the old pine carving and wood panelling a throwback to what some of the old Centre Block would have been like. The blue iron work with gilded tips along the library's exterior also went around the original building. A steel fire door, and plenty of firefighters, helped save the structure and the books inside. "The whole thing was a work of art, and from that standpoint of view it was a priceless loss," said Lucile Finsten, co-author of the 1988 book "Fire on Parliament Hill!" "We only think of the library as a separate entity because the original building isn't there anymore. The way it was designed, it wasn't a library and a Parliament building, it was one entity," said Mizgala. "You can see the shift in the two kinds of stone. You get a sense of what the walls and the physicality of the old building must have been."